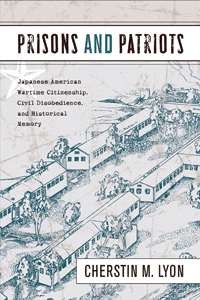 “Prisons and Patriots: Japanese American Wartime Citizenship, Civil Disobedience, and Historical Memory” is written by Cherstin M. Lyon, an assistant professor of history at the California State University, San Bernardino. According to the publisher, “Prisons and Patriots” provides a detailed account of 41 Nisei, known as the “Tucsonians,” who were imprisoned for resisting the draft during World War II. Lyon parallels their courage as resisters with that of civil rights hero Gordon Hirabayashi, well known for his legal battle against curfew and incarceration, who also resisted the draft. These dual stories highlight the intrinsic relationship between the rights and the obligations of citizenship, particularly salient in times of war. Lyon considers how wartime civil disobedience has been remembered through history — how soldiers have been celebrated for their valor while resisters have been demonized as unpatriotic. Using archival research and interviews, she presents a complex picture of loyalty and conflict among first-generation Issei and Nisei. Lyon contends that the success of the redress movement has made room for a narrative that neither reduces the wartime confinement to a source of shame nor proffers an uncritical account of heroic individuals. “‘Prisons and Patriots’ adds welcome depth and analysis to a growing number of works that are now disclosing two increasingly important reasons the Japanese American experience during World War II needs further research: first, the complex ways in which the Japanese American communities responded to the unconstitutional barbarity with which the U.S. government treated them and, second, the fascinating ways in which postwar actors sought to play roles in the crafting of a metanarrative for the ethnic group, the war, and the nation,” stated Franklin S. Odo, chief, Asian Division, Library of Congress.